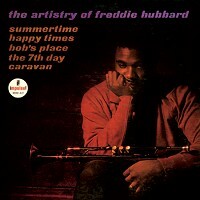 By the time this album was recorded in 1962, the 24-year old Freddie Hubbard had worked with Slide Hampton, Max Roach and J.J. Johnson prior to his association with Art Blakey's Jazz Messengers. Miles Davis listed Hubbard among the top jazz trumpeters of the day. This was Freddie Hubbard's debut on the Impulse label, and to showcase his trumpet artistry he organized a group of top instrumentalists to give him full support. The group included John Gilmore, tenor saxophone; Curtis Fuller, trombone; Art Davis, bass; Tommy Flanagan, piano and Louis Hayes, drums. Freddie Hubbard wrote three of the five compositions.